April is Earth Month. A month dedicated to giving the giant blue marble we call home some extra love. A month where we focus on all things pertaining to the longevity of our planet: climate change, conservation, preservation and lessoning our carbon footprint. In reality we should be consciously implementing environmental responsibility all year long. The Earth is here for us 365 days a year. You would think we could perhaps eek out more love for it rather than just 30 days, or more specifically the ONE day denoted as Earth Day. For Aveda, every day is Earth Day. It is inspiring working for a company that makes caring for our world a primary concern. I knew Aveda utilized wind turbines to power their Blaine, Minnesota plant and uses up to 100% PET recycled plastic in its product bottles – what I didn’t know is how many years and how far reaching their goal of environmental leadership spanned. In addition to being wind powered, Aveda’s headquarters is also a wildlife habitat certified by the National Wildlife Federation. Aveda also sponsors a butterfly garden at the Minnesota Zoo to raise awareness about pollinating insects and their impact on their world. And most importantly, Aveda has supported the Audubon’s Upper Mississippi River Initiative through their Earth Month Programs. Twenty six years ago Aveda was the first company to sign the Ceres Principals for corporate responsibility. These principals stipulate the safe guarding of the Earth by developing environmentally friendly standards. Clean water has always been Aveda’s “thing” when it comes to Earth Month. And with a company squarely centered around an industry that focuses on hair and skin care, it should be. The beauty industry uses a lot of our most precious resource, water so it makes sense that we should do all we can to offset the amount used and what is being returned to our oceans, lakes, rivers and streams. Clean water should be available to all and making it available to all should be a top priority. This is why Earth Month is Aveda’s shining star. We need to celebrate the Earth and what it does for us…so what better way than a party? 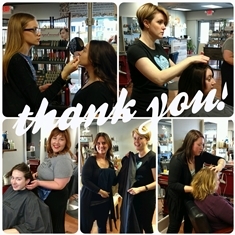 On April 9th Salon Enso hosted its first ever Earth Month Cut-a-thon. It was a spur of the moment decision that turned out to be a super successful event. For those not in the know, a Cut-a-thon is like a marathon (for a stylist) that involves scissors. We set the hours and appointments; you book the time and then pay for your cut by donation. The response was truly stellar! We had current clients, new clients and people who heard about the cause and decided to rally for clean water. There were mocktails and mimosas, makeup touch ups, scalp and hand massages and most importantly – MASSIVE smiles the whole way around (oh and great hair too….can’t forget about that). Our entire event was all but filled to the max and saw us raise a total just shy of $1000. We are one third of the way to Salon Enso’s goal of $3000 dollars to give to Clean Ocean Action our local Earth Month partner. So massive props, thanks and kudos to all that came to party with us and celebrate the Earth and clean water! But the party doesn’t just stop there….it goes all month long. If you missed the Cut-A-Thon at Enso there are still plenty of other ways to metaphorically give the Earth a big hug. One hundred percent from each and every brow wax performed throughout the month will also be added to our Earth Month fund. Help shape the way for clean water by getting your arches in gear! We are also continuing our celebration by offering a mocktail of the week – or a delicious and refreshing fruity beverage sans “party water” for a $1 donation. Aveda has championed the way for environmental leadership for nearly three decades. They care about the world we live in as well as its inhabitants, whether of land, air or sea – human, scaled, furry or hairy. Their mission firmly states the belief that caring for the planet and caring for oneself go hand in hand. Aveda leads the environmental charge by example and we follow suit whether it is through the products used, time dedicated or the month long parties we throw. Let’s band together and show this big blue marble how much it is loved, 365 days a year. Next Next post: April Earth Month Events!